The one thing I know about Three Angels is that they are mentioned in Revelation 14. And I’m going to deal with this for a moment because in this article I think Dylan might be talking about Revelation, but in a way that really is a bit of a surprise. A third angel followed them and said in a loud voice: “If anyone worships the beast and its image and receives its mark on their forehead or on their hand, they, too, will drink the wine of God’s fury, which has been poured full strength into the cup of his wrath. They will be tormented with burning sulfur in the presence of the holy angels and of the Lamb. So in short (and I mean no offence by offering a simplified version of the Bible at this point, it is just how I read it), three angels announce the end of the world, and anyone who has not followed God will be tormented for ever. Seeing this as a central moment in the Bible, the 7th Day Adventist church suggested that the first angel’s message occurred sometime between 1824 and 1844. Then the second angel’s message was preached in 1844, and by this view should have led to the Second Coming. The Seventh-day Adventist movement then took it upon themselves to continue preaching the three angels messages, having a God-given mission to preach this particular message to the whole world to join their movement ahead of the Second Coming. What makes this interesting for me, as an outsider in all this, is the fact that the Adventists state that Sunday is not the Lord’s Day and that those who do worship on a Sunday will receive the mark of the beast once everyone on Earth knows of their message. Maybe. Maybe he was fed up with people interpreting each song as a work of genius, and wondered just how far he could push us before we gave up and admitted he wasn’t doing anything good here. If you believe in God there is a reason why, although you might not be able to comprehend it. If you don’t believe there might not be a reason at all, or if there is one, it is as beyond our comprehension at the moment as the workings of a nuclear power station are to a shoal of fish swimming in the warm waters near its outflow. Now I am confused. Why are the angels on their poles? Does it say that in Revelation? I thought it was one of the few books of the Bible that I knew quite well, but I don’t recall the poles – help me out here please. Supposing the whole world turns away from God and no one takes any notice of the Angels. What then? Does the world end in Revelation with no one being saved? Have we all lost the plot? That is quite a thought, and it is one that crops up in a number of science fiction stories in which the Deity is dependent on the worship of the lesser beings, and withers away when the worship stops. If that is Dylan’s message here I really do wish he’d managed to find us a tune, and wish he had worked a little harder on the imagery. It is a fascinating concept and one I am not sure I have heard debated full elsewhere. But what am I saying? This is Dylan. How dare I tell him what to do? I shall admonish myself at once. This entry was posted in New Morning, Uncategorized. Bookmark the permalink. Interesting connection to Seventh Day Adventist theology. That is my tribe. Is it yours? I’ve always felt Bob was describing a real view. He was living in NY at the time, and someone who knows the area being described will have to take further the significance of the wealth of topographical detail, but my take was Bob looked out his window, seeking inspiration, say three angels (perhaps displayed as Christmas decoration) thought of the Biblical connection and extrapolated (!) 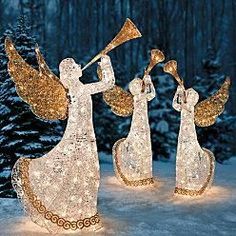 The angels, I suspect, are plastic, joined together, and playing musical instruments, which will have got Bob interested. To me the basic message coming across is that there is a relationship between the tawdry reality our senses experience and the real world of the spirit, that the former is but a weak indication of the powerful truth contained in the latter, and that as a result most people wander about oblivious to this important (Christian) message. As such I, being a non-believer, see it as a pretty limited song and about as likely to affect your life as “If Dogs Ran Free”. Your interpretation is interesting. That said, I think you are over-reaching here. The “New Morning” album is all about contrast: country/city; freedom/obligation; day/night; two/three. The last two songs on the album play with this theme. “Father of Night” comes in twos; “Three Angels” comes in threes. “Father of Night” is country, nature, cold/heat; Fall/Spring; night and day. “Three Angels” is all city/concrete, busy. Tellingly the title of the album plays with this: morning is the transition from night to day. I’ve always seen this song as nothing more than an early morning observation of a city street and the day to day mundane activities after the hype of Christmas – the whole thing unfolding beneath the light pole angel Christmas decorations. Maybe he just saw three angles like these, only up on a lamp post in NYC. Thanks for the comments about the Xmas decorations and New York. It seems this time I’ve really suffered from writing from England and never having been in New York at Christmas. Steve, thanks for that. Another fact I didn’t know about this piece. This song is about Dylan driving a bakery truck, one of his first jobs when he arrived in New York’s Greenwich Village. He was simply telling us what he saw on his route which included some sort of Christmas Angels display hanging from a building or church..nothing more. Hello Tony, yes one more fine piece of detective work. Join us inside Bob Dylan’s Music Box http://thebobdylanproject.com/Song/id/671/Three-Angels and listen to every version of every song. He compares the 3 enlightened angels with 3 electric guitarist.